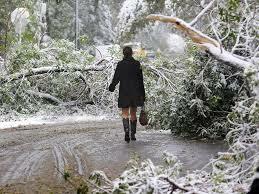 Get ready for another Ice Storm year by having your trees and shrubs protected as much as possible. Reducing excess weight from stressed limbs is a good way to help control mother natures effects when she lays down layers of ice on the trees. El ninio is upon us there is an Increased Risk for Ice Storms in Ontario, Quebec This coming winter will not be nearly as cold as last winter thanks in part to El Niño. This should lead to a noticeable difference in heating bills compared to last year. Unfortunately, the winter pattern will also favor an increased risk of ice storms, especially from eastern Ontario to southern Quebec, including the cities of Ottawa and Montreal. Much of Ontario, including the lake-effect snow belts will have less snowfall compared to normal, as the main storm track shifts to the south and east during January and February. As the storm track shifts toward the East Coast later in January and February, there will be an increased risk for significant snowfall events across eastern Quebec. Call us to help trouble shoot before the storms hit.